The Proven Winners® name should always have a ® – a register mark should be used at all times and with the first appearance in copy. 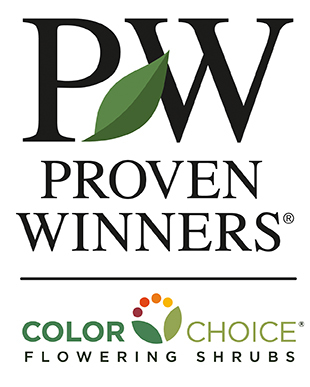 The Proven Winners® logo can be used with or without a tagline. The current tagline is “The #1 Plant Brand.®” for all uses except for trade applications. The tagline “A Better Garden Starts with a Better Plant.®” is a protected tagline but not currently in use. The Proven Winners logo can only be used as described below. The Proven Winners logo cannot be used in other colors. The Proven Winners logo is set is Times Regular, all caps. The taglines are set in Univers 47 Condensed, caps and lower case. The photos, graphics, logos, images and copy available for download from this website ("Items") are for use only by wholesale growers, retail garden centers, the news media, or individuals or companies working on their behalf. By downloading the Items, you agree that the Items shall only be used for creation of brochures, point of purchase material, advertising for Proven Winners products, or for news/stories reporting about Proven Winners products. The Items cannot be used for creation of packaging, including plant tags, stake tags, plant containers or pots, or stickers or other information used on tags, containers or pots. The items are the intellectual property of Proven Winners North America LLC or its partners, and are subject to the protections of copyright, trademark, and unfair competition law. If you have questions: please contact Marshall Dirks from Proven Winners at 877-895-8138 prior to usage.